Some of us look at the U.S., mighty superpower that it still is, and wonder just what in the world is going on. Fake news, Russia-gate, rampant anti-Trumpism, America First rhetoric, citizen polarization and pugnacious confrontations with other nations. How might we make some sense of this? 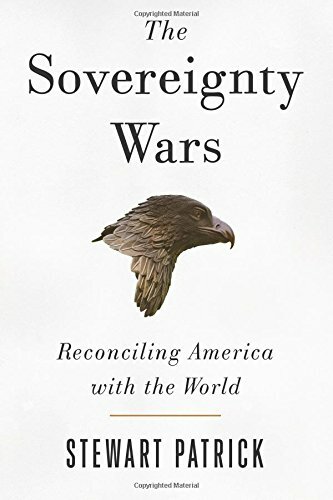 Stewart Patrick’s ambitious book, The Sovereignty Wars: Reconciling America with the World provides some answers. In painstaking detail, he argues that America is at war with itself. There is a deeply-rooted tension within the Republic: should this exceptional, God-infused nation go it alone as an incandescent light upon the hill? Or should it work with other nations to build a collectively secure, prosperous, and just world for everyone? The tension between these two positions might be labelled America’s premier anxiety disorder. These are momentous questions for the future of humankind—particularly in the post 9/11 fragmented and hysteric world of the 21st century. Patrick’s main contribution to America’s “great debate” is to explore the way Americans have argued about their role in the world at different crisis points in history. Patrick identifies five core conversational arenas of America’s great disputes: international law, national security, globalization, immigration and border security. This will be of interest to many readers. America emerges as a “great power” around 1900, touching off a “momentous debate” regarding America’s “international role.” After the catastrophic World War I, America faced its first of numerous great, tumultuous debates. Woodrow Wilson, president from 1913–1921, wanted a world that “embraced the ideal of collective security, arguing that the United States should be willing to compromise its sovereign autonomy—and even a degree of sovereign authority—to make such a scheme work.” He thought that “only a universal international organization grounded in international law and committed to deterring and defeating aggression could ensure lasting peace.” But for isolationists, the idea that “no nation should seek to extend its policy over any other nation or people” was too much. The U.S., Patrick reminds us often, contributed enormously to laying the scaffolding of an international order in the post-World War II world. They played a major role in the founding of the UN and laying the structure of peace. The League of Nations had lacked teeth. But they were now faced with the possibility that the UN’s creation of a “standing army would threaten U.S. sovereign authority and autonomy raising complex issues of command and control.” Wendell Willkie argued that if America was to guard zealously its own sovereignty, how could it commit itself to an “international organization with the power to prevent aggression and preserve peace”? This hard-edged resistance to any form of external judgment pulses through American political discourse. With the collapse of the superpower USSR in 1991 and the terrible events of 9/11, the U.S. could not resist the great temptation to cast aside their international obligations and legally binding treaties. Although they certainly could have chosen to chart a different pathway toward a post-national constellation, they did not. In a revealing and hard-hitting chapter on Bush’s revolution and U.S. foreign policy, Patrick states that “America” was now “unbound” (Daalder and Lindsay’s phrase). Bush and his associates tossed aside like old ragged dolls longstanding institutions and partnerships. They renounced treaties such as the Anti-Ballistic Treaty with Russia, repudiated the Kyoto Protocol, and blocked verification protocol to the Biological Weapons Convention. America was unique and supremely powerful. They would act as they saw fit, without consultation with anyone. America had promoted international security institutions as a foundation for U.S. leadership. No longer. They could do without the constraints of international law. Just look at all those UN treaties that the U.S. won’t sign (as well as the ICC treaty). But this story has an ironic twist or two. Patrick points out that the American anxiety disorder manifested itself in the post 9/11 world as a loss of confidence in the world they had built. The U.S. was exceptional and vulnerable. It was ironic that while America was clinging desperately to the idea of sovereignty-as-autonomy, their corporate leaders were busy dismantling their industrial economy. They placed themselves at the mercy of other places where their outsourced labor worked themselves to the bone. On the one side, the ideology of sovereignty as autonomy; on the other, the loss of autonomy and freedom of the mass of American workers. There are two mighty forces pulling America in opposing directions. That’s the heart of Patrick’s worried text. But Patrick, in the end, cannot imagine how America can burnish its tarnished reputation of the keeper of world order. Too many of the world’s citizens believe that this world order is fueled by national self-interest and hubris. Can America find the vital spark needed to walk the cooperative pathway? Michael Welton’s most recent book is Unearthing Canada’s Hidden Past: A Short History of Adult Education (2013). He is the author of many books and articles on educational history, critical social theory, religious studies, and international affairs as well as an award-winning biography. He is also a regular contributor of articles on current and international affairs at CounterPunch.